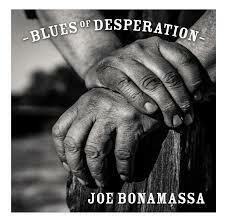 It is now hard to believe that as recently as five years ago, guitarist Joe Bonamassa was largely unknown. But with his albums hitting No. 1 with such regularity, the top chart position seems to be an afterthought now. Such is the case with his 17th release, “Blues Of Desperation.” The project is once again helmed by producer Kevin Shirley. While some tracks have a little sheen on them, in typical fashion, Shirley allows the analog age to permeate the 40 minutes. Some numbers feel like a one take effort. Bonamassa sticks with his overly capable lineup that features Anton Fig on drums, keyboardist Reese Wynans and Michael Rhodes on bass. Background vocalist and “The Voice” winner Mahalia Barnes is a soulful addition to the ensemble as is a small horn section. While the album is all original material, Bonamassa has only one solo writing credit on the closer, “What I’ve Known For A Very Long Time,” However, he shares co-writing duties on the remaining 10. Lyrical themes do not venture far from standard blues fare; There is hardship, heartache, a river and two train songs. What makes this effort interesting are the style variations. The haunting ballad “Drive” contrasts with the gospel feel of “How Deep This River Runs” and the jazzy Bonamassa penned closer. The album contains traces his previous collaborations, “Mountain Climbing” has a nasty groove similar to his work in Rock Candy Funk Party. Elsewhere Fig resurrects the booming tom work of the now disbanded super group Black Country Communion. While there is plenty of signature shredding, it is less blunt force trauma and more interwoven into the cohesive effort. This album feels more finessed and polished and showcases the talent of the band. Bonamassa feels more like a front man here. As he plans his 40th birthday party, it appears he is now mastering musical vertical integration.